Hawthorn’s main medicinal benefit is due to its bioflavanoid content. The relax and dilate the arteries, especially the coronary arteries. This in turn, increases the flow of blood to the heart muscles and reduces symptoms of angina. The bioflavonoids are also strongly antioxidant and help to prevent the degeneration of the blood vessels. 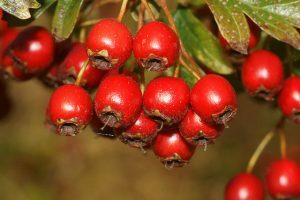 As a cardiac tonic, there have been a number of trials performed which have confirmed Hawthorn’s valuable ability to treat chronic heart failure. It works in combination with Lime Blossom, Mistletoe and Yarrow for high blood pressure and the circulatory system. For poor memory, combine with Gingko. Active Constituents: Bioflavonoids (rutin, quercetin), triterpenoids, cyanogenic glycosides, amines in the flowers only, polyphenols, acids including ascorbic acid, coumarines and tannins. Should not be used with commercial cardiac preparation except under strict health practitioner supervision. Care should be taken when used for low blood pressure and only under strict health practitioner supervision.